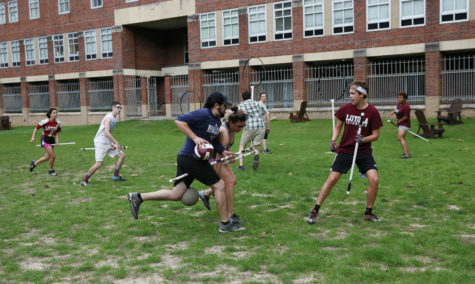 Tad Walters, history sophomore and Quidditch player. 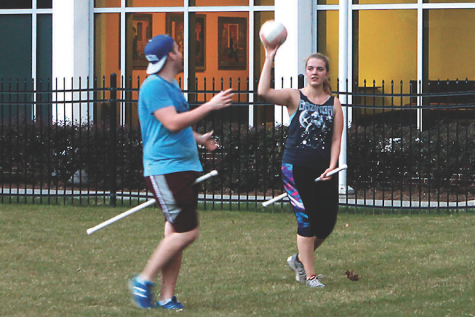 You’ve probably seen them in the residential quad – the students playing the magic-less version of Quidditch, substituting flying brooms with household broomsticks. 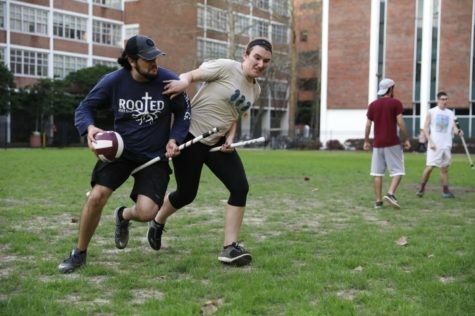 It may be easy to make fun of them for playing a game that comes straight out of a fantasy series, but Tad Walters, history sophomore, has no intention of giving up the game he picked up his freshman year at Loyola. 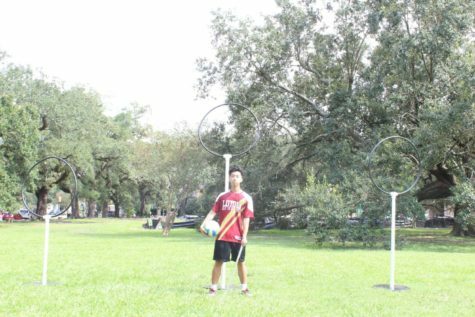 W: I guess I have to ask the basic question: Why Quidditch? 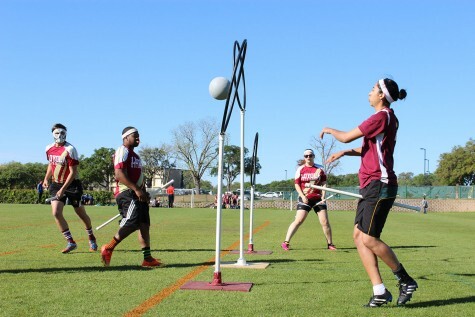 TW: I saw Quidditch and I was like, ‘I like Harry Potter, I’ll see what’s up with that’. So I played and I liked it. It’s pretty physical and I like that. W: How big of a Harry Potter fan were you? Did you have all the books growing up? TW: I read the books, and I’ve seen the movies. I wouldn’t say that I’m any kind of spectacular fan. I’m just a normal kid that liked Harry Potter. W: What position do you play? TW: I play Beater, I play Chaser sometimes, and sometimes, Seeker. A lot of time I’ll know the Snitch, so if I know what I can do to catch them, I’ll play Seeker. W: What’s the difference between this practice broom and your game broom? 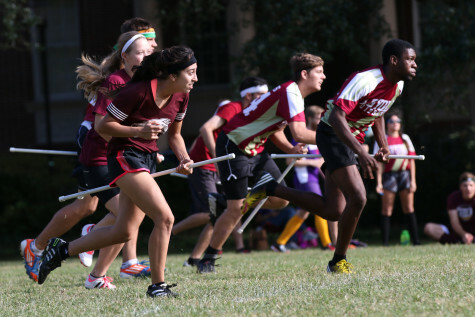 TW: These are the same, but IQA [International Quidditch Association] official game brooms have to be standardized, unless the team captains can agree that certain brooms are fine. I’ve been in games before where the team captain says I can’t use my broom because he’s not comfortable with it. But most captains don’t really care, as long as it’s not made of metal or anything. 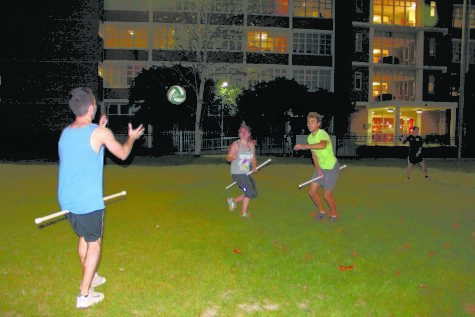 W: Do you get recognized a lot as one of those guys out there in the quad playing Quidditch? TW: Yeah, especially since I’m into the whole Quidditch community as well and I talk about it constantly with all my friends. 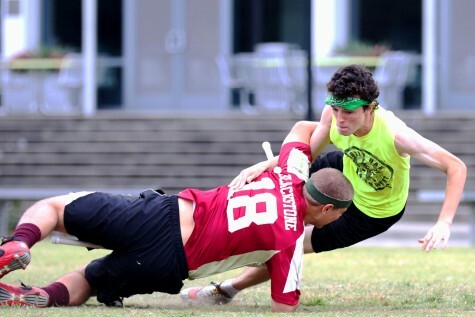 So I’m like the Quidditch guy. I guess it’s kind of a good thing. W: Do people make fun of you for it? TW: Yeah. Every day at practice, we hear the typical ‘Ten points for Gryffindor’ and it’s like, ‘Wow you’re so original, I’ve never heard that one before’. There are people that heckle it and that’s perfectly fine. I kind of expect it. I mean, we are running around with broomsticks between our legs. W: How far away are we from having actual flying brooms? I think that would really help the sport take off. TW: I really don’t know. I’m not like an engineering major or anything. I don’t even know if that would adapt to the sport because that’s really dangerous to fall off your broom onto the ground. W: Danger works for sports like NASCAR; half the people who watch those races are waiting for the crash. If the brooms actually flew and someone had to fall a few feet, I think that would add to the excitement. TW: It would definitely make the game closer to what it is in the book. That’s for sure. W: But since we are just mortals, what’s one rule that has been represented in the movies and in the books that doesn’t translate? TW: Probably the major thing is how the Snitch works. In the books the Snitch is this little ball that flies around and it’s really hard to see. 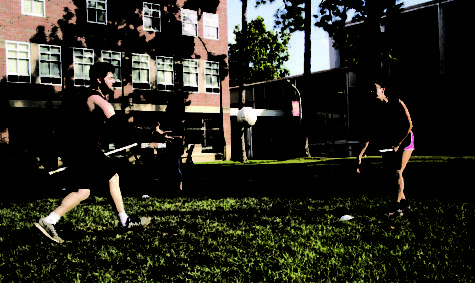 Catching the Snitch gets 150 points for your team. They actually made the Snitch 30 points in the real life version. Not only that, they made the Snitch a person. So basically the Snitch is a third-party player from a team that’s not playing currently. W: Is there anything a Snitch can’t do? If a Snitch wanted to get in their car and drive off for a while, could they do that? TW: They can. I’ve seen it before. W: I always wondered this whenever I see you guys practicing, but did a lot of you guys play soccer? TW: Yeah, from what I’ve seen from teams everywhere, soccer is normally one of the sports someone plays before they come to Quidditch. W: Baseball players are notoriously superstitious; do you have any superstitions or pre-game rituals? TW: Every player has their own ritual, but our team as a whole, just does a chant to start the game, that’s pretty much it. W: What’s the farthest you guys have traveled? TW: So far it’s been Tampa to play in what was called the Bay Cup. That was hosted by the University of South Florida. It was basically us and a whole bunch of Florida teams. W: What is your favorite thing about the sport? TW: My favorite thing, I think, has to be the physicality. 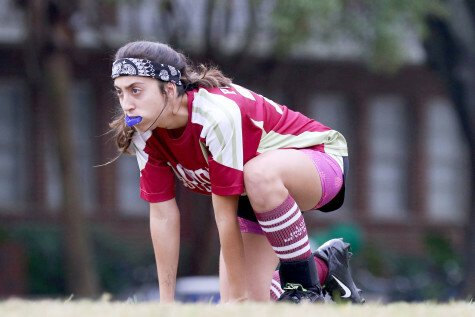 I’ve always grown up playing sports – football, mainly. And so I really enjoy that.